"Everything we do at Great River Shakespeare Festival aspires to create conversations with and among our company and audience....We start with Shakespeare because, of any work of art we could choose, Shakespeare's plays give us the best chance to inspire deeply nuanced, complicated, unexpected conversations that embrace with compassion the universal experience of being human and welcome every person into that conversation with their own unique and valuable perspective....At this moment, we need the honest give and take of real conversation more than ever." This dedication to conversation is not mere lip service. In addition to presenting four mainstage productions, the festival also includes a wealth of concerts, conversations, workshops, classes and other opportunities to connect with the community. Friends, we LOVE the theater festival experience. 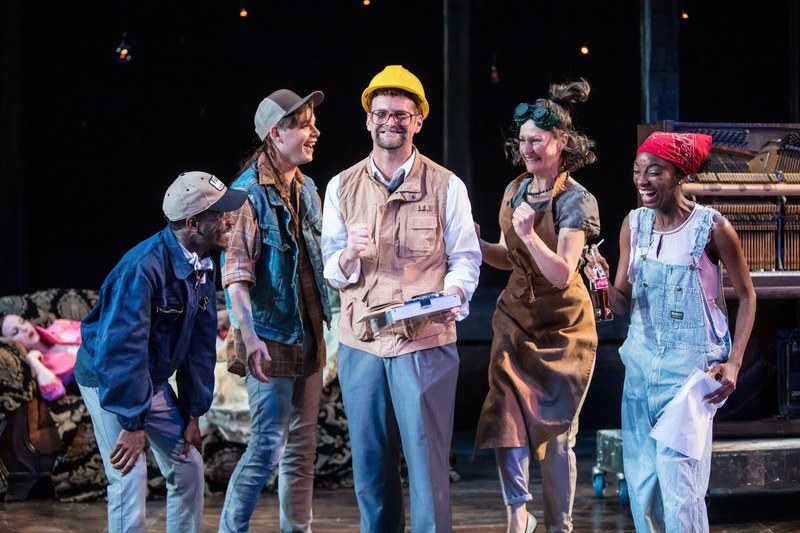 Shows are performed by a company, in repertory, so in a matter of days, you have the opportunity to see the same actors performing different roles in several plays. Not only is it a super impressive feat of acting, but you get the opportunity to really see an actor's range. 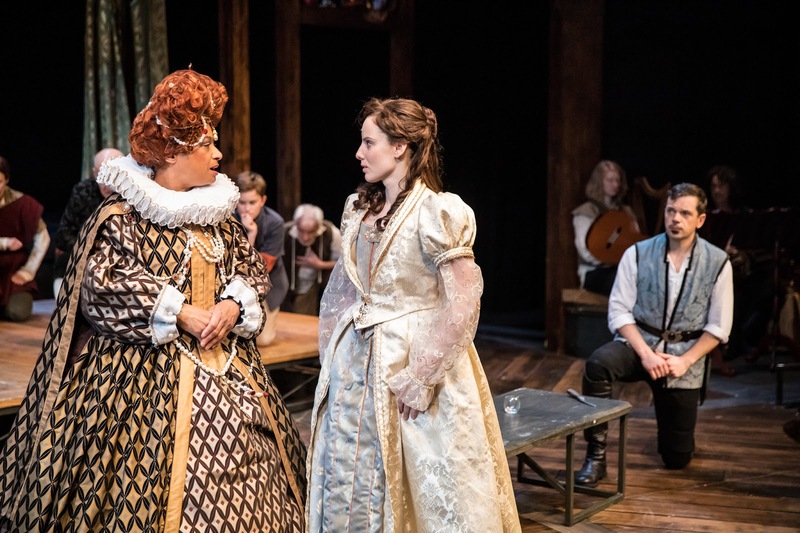 We have become devotees of Wisconsin's American Players Theatre, and the Stratford Festival in Canada should be on every avid theatergoer's bucket list. But Great River Shakespeare Festival is right in our backyard, and it's a gem not to be missed! 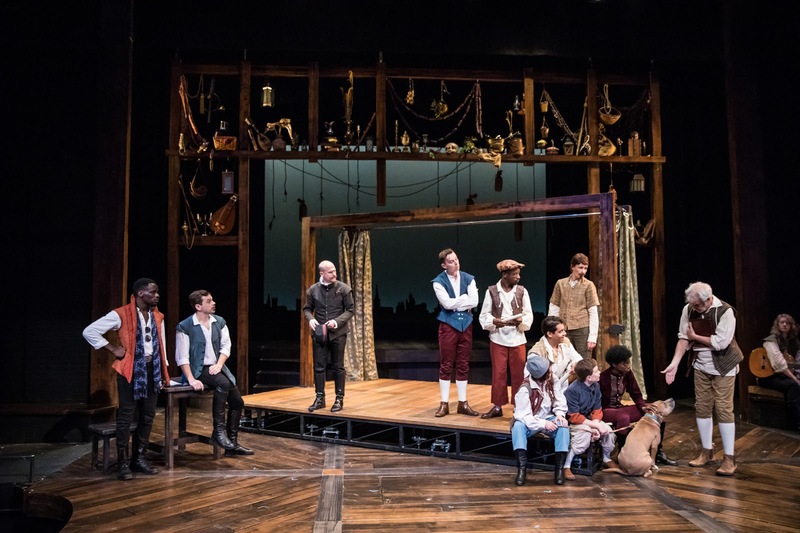 In their 15th season, GRSF is featuring four mainstage plays: All's Well That Ends Well, Shakespeare in Love, and A Midsummer Night's Dream, with Venus in Fur playing in the black box theater. They're also presenting an intern/apprentice production of The Merchant of Venice, which sadly wasn't playing the weekend we attended. We saw the three mainstage productions, missing only Venus in Fur, which luckily, our friends Cherry and Spoon and Twin Cities Stages saw. In order to get the full festival experience, we started our visit to GRSF on a Saturday morning with one of their Front Porch Conversations. These are "moderated discussions with artists, academics, and fellow community members to more deeply explore the themes and ideas that begin in the theater." Our Front Porch Conversation was with Tonia Sina on Intimacy Directing: Creating Safe Spaces On and Off Stage. Tonia Sina is one of the founders of Intimacy Directors International, which is dedicated to "choreographing of Moments of Intimacy in performance. The focus is on subtle and specific details in movement and intention, for the purpose of telling the story of the scene." Sina was invited to GRSF for a series of intensive workshops and talks, and her work is absolutely fascinating and so relevant. We will discuss her work more extensively in an accompanying blog post. Directed by Rick Barbour, All's Well featured strong performances across the board. Standouts include Caroline Amos as Helena and Melissa Maxwell as the Countess of Rossillion, Bertram's mother, both of whom make Shakespeare's characters emotionally accessible and relevant. 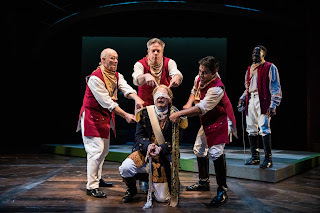 We were utterly amazed by Zach Curtis's performance as the ailing King of France, and his physical transformation when his character regains his health and power. Parolles ("a boastful follower of Bertram"), played by Christopher Gerson, added comic relief touched with poignancy. The spare set, exquisite lighting, and costuming all created a timeless feel to this play. One element we loved was the director's handling of the end of the play, wherein he creates a powerful demonstration of forgiveness. 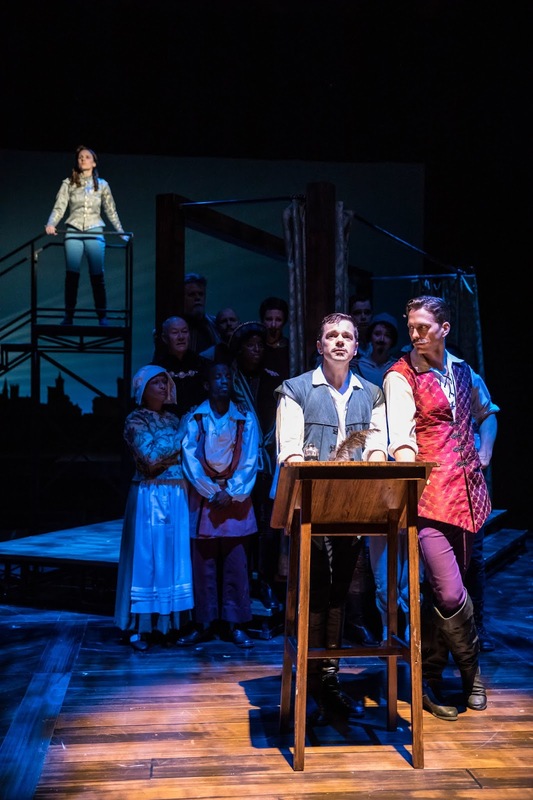 On Saturdays, between the matinee and the evening performance, GRSF offers a Narrated Set Changeover, where audience members are invited to stay and watch the transformation from set to set. We didn't stay for this, but it sounds super interesting. This year, GRSF has Concerts on the Green an hour and a half before every performance. 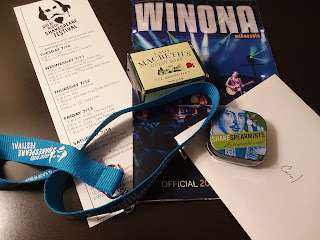 We listened to music (Burke Band/Patina according to the handy bookmark of events for the weekend), grabbed a Winona Burrito from a food truck, enjoyed an Island City Radler in the wee beer garden and headed off to our evening show. 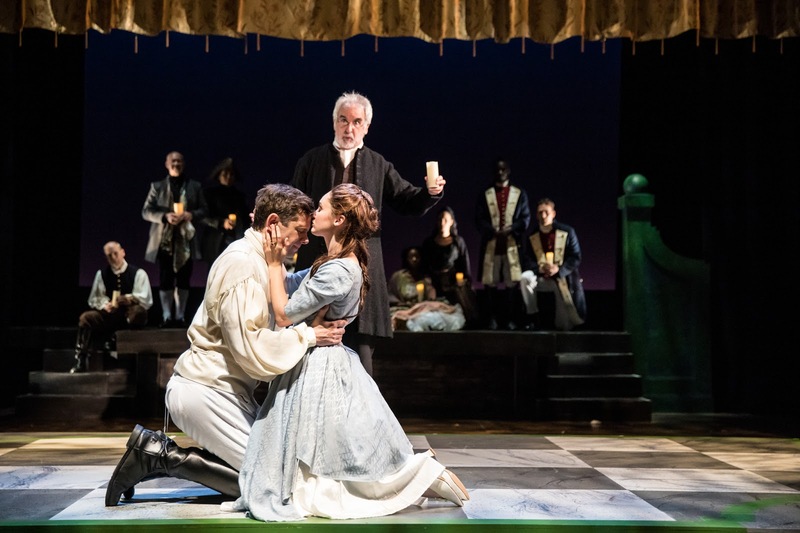 We had seen Shakespeare in Love at Chicago Shakespeare Festival a few years ago, and weren't overwhelmed by it. But we gave it another chance, and found it very enjoyable. Based on the screenplay for the 1998 film by Marc Norman and Tom Stoppard, and adapted for the stage by Lee Hall, the play tells a fictional story of William Shakespeare's love affair with noblewoman Viola De Lesseps, who dresses as a man to become an actor and inspires some of the playwright's greatest works. "I will have poetry in my life. And adventure. And love. Love above all." Twin Cities favorite Anna Sundberg (now based in NYC) plays Viola De Lesseps with zeal and affection, and Christopher Peltier makes a charming William Shakespeare. Again, the cast is uniformly excellent with a definite standout in Benjamin Boucvalt, who creates such a roguish, irrepressible Kit Marlowe that we definitely felt the loss when his character disappears from the play. Christopher Gerson gives another hilarious performance as Fennyman, the producer who learns to love the theater and his small role in it. Director Doug Scholz-Carlson and choreographer Brenna Mosser do an amazing job with a spare but evocative set (by R. Eric Stone), keeping the cast in constant motion, which created an incredibly energetic and dynamic production. 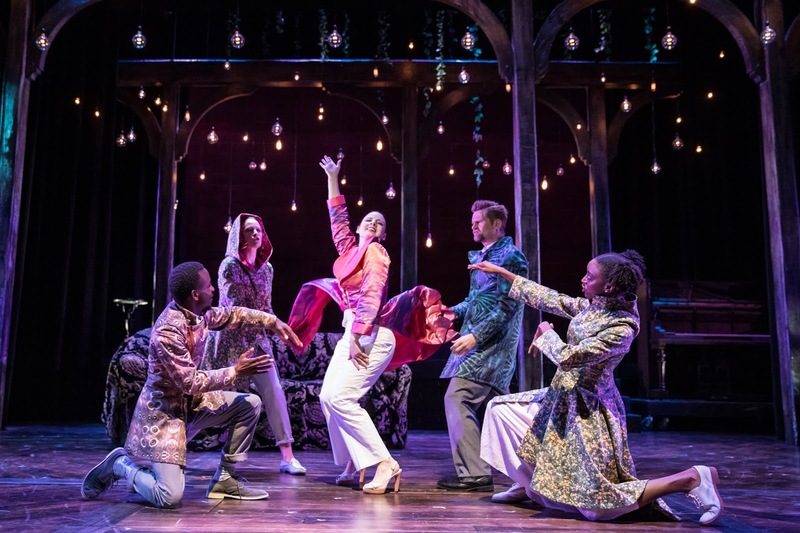 It was particularly compelling to watch the themes of love and intimacy on- and off-stage play out after hearing Tonia Sina discuss intimacy direction. Our huge kudos to GRSF for bringing her to Winona and addressing these issues so directly. On Sunday morning, after Cherry and Spoon ran the Will Run (a 28-furlong race around Lake Winona hosted annually by GRSF--with the CUTEST tee shirts), we joined some of the company at Blooming Grounds coffee shop for a Company Conversation with Tonia Sina, Artistic Director Doug Scholz-Carlson, Managing Director Aaron A. Young, and Marketing & Sales Director Eileen Moeller. They put it on Facebook Live, so you can see it below! This was another fascinating discussion of intimacy on the stage, and what makes it truly unique is that it was open to the public, but also included members of the GRSF company, so the discussion was wide-ranging and still very relevant. We feel so fortunate to have come down to GRSF this weekend and have to been introduced to the world of intimacy direction. And then, all too soon, it was our last show of the weekend: A Midsummer Night's Dream, directed by Beth Gardiner, with an eight-person cast, all of whom were exceptional. Benjamin Boucvalt, Andrew Carlson, Anique Clements, Zach Curtis, Antonio Duke, Leah Gabriel, Silas Sellnow, and Anna Sundberg were ALL fantastic. Apart from being an utterly lovely, lyrical production, we have to call out the wonderful costumes by Rebecca Bernstein. From Puck's gorgeous screen-printed coat, to the fantastic (literally) Bottom head/hat, to Hippolyta's power suit, to Peter Quince's foreman ensemble, the costumes perfectly delineated each character, as the actors made quick-change transformations. We adored Zach Curtis as Puck and Silas Sellnow as Bottom, and were delighted to learn that they had been intended for each other's parts. The entire company and creative team at Great River Shakespeare Festival is outstanding. We loved having the opportunity to see a number of varied and delightful performances by wonderful actors (so lovely to see Zach Curtis again), and we loved the racial diverseness of the company (always love seeing Antonio Duke and we appreciated new--to us--discovery Anique Clement). 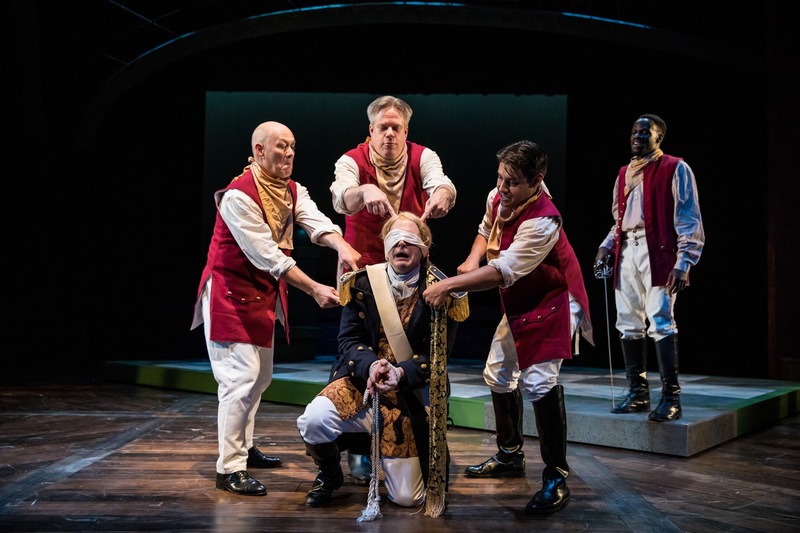 Friends, put Great River Shakespeare Festival on your theater to-do list. Winona is a lovely small town, it's not terribly far from the Twin Cities, and the theater? Is unbeatable. "We offer instead a few stories. ... You'll certainly need your brain, but this summer you will use it in service of your heart. We won't untangle all the great issues of the day, but in this little corner of the world, for the fifteenth summer, let's have a conversation."